What if the seller bids first? As we continue to study the UCC 2-328, another question has arisen in this regard and we explore today. In a somewhat modest legal case, an attorney informed me that he represented a buyer who felt injured by the seller bidding against him without authority. In particular, an item selling for about $1,000 was won by this attorney’s client, and subsequent to that, the buyer found out the seller bid the first bid of $100 on this same item. For a with reserve auction (and necessarily not a without reserve auction) the seller can bid if notice has been given that liberty for such bidding is reserved. If the seller bids otherwise in a non-forced sale circumstance, the buyer has recourse. “He can certainly take the property at his high bid, or avoid the sale altogether, so he does have choices.” I told him. Otherwise, the UCC 2-328 doesn’t prescribe a solution. “Couldn’t the first bid be considered -0-? In other words, there are no bids (zero valuable consideration) prior to that seller’s first bid?” the attorney countered. I told him I was unaware of any court which had ruled that the first bid at auction is -0- and then the first offer is actually the second bid; what auctioneers do is invite offers. Bidders make offers (bids) so until someone actually tenders an offer, there are no bids. Of course this attorney wanted to argue that his client could take the property for nothing, rather than either pay full price or give up the property. The UCC 2-328 doesn’t help with that argument. The attorney had found me via my blog and encouraged me to write about this issue, so I obliged. What if the seller bids first? 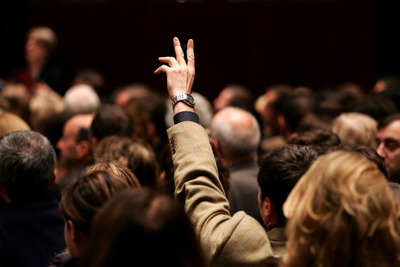 In a with reserve auction without sufficient disclosure, it limits the possible legal recourse of the buyer. Mike Brandly, Auctioneer, CAI, AARE has been an auctioneer and certified appraiser for over 30 years. His company’s auctions are located at: Mike Brandly, Auctioneer, Keller Williams Auctions and Goodwill Columbus Car Auction. He serves as Adjunct Faculty at Hondros College of Business, Executive Director of The Ohio Auction School and Faculty at the Certified Auctioneers Institute held at Indiana University.